Boyne Highlands and Boyne Mountain have installed state-of-the-art snowmaking control systems that streamline management of each resort’s colossal snowmaking fleet. And that’s just the start of what’s new. At Boyne Mountain, the new season also brings two new ziplines, concessions at the Tubing Park, lively après ski parties, new Junior pricing and online ticket sales at Avalanche Bay Indoor Waterpark, expanded lift hours on Disciples II, improved lighting on McLouth, new features in the Burton Riglet Park and new Nordic signage, plus more rental equipment. Providing the latest in rental equipment, Boyne Mountain has also added 200 new sets of Head skis and boots, as well as new Burton Learn to Ride (LTR) boards, boots and bindings for adults and children. This winter also brings improved Nordic trail signage throughout the trail network as well as widened trails maintained by full size groomers for better consistency and quality of Boyne Mountain’s 35 km of cross country trails. 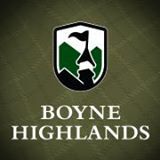 The BOYNE experience offers snowsports on two mountains, Boyne Highlands Resort in Harbor Springs and Boyne Mountain Resort in Boyne Falls, located 27 miles apart, offering Lower Michigan’s highest vertical and longest runs. Lift tickets and season passes are interchangeable, providing the best value in Michigan. The rolling hills surrounding Harbor Springs sets a stunning scene any time of year, and much of the meeting space at this resort offers spectacular views of that beauty. Spend a half day gettin’ some hard work done, then head outdoors to golf, ski, or make some memories on a group outing: there’s a zipline course, scenic chairlift rides, a complementary nine-hole golf course, and more. Event space for up to 600 attendees; short drive to picturesque Harbor Springs. UPDATE FOR 2017: Après ski with expanded lanes at the Tubing Park … Cool snowshoe and dine experiences … New program director for Boyne Flyers and Team Elite.